Zen River is an international Buddhist monastery that is located in a beautiful property on the outskirts of Uithuizen, a small village on the northern edge of The Netherlands close to the Waddensea. It enjoys the spaciousness and tranquility of the countryside and yet is easily accessible by public transport. Zen River was established in 2002 and aspires to keep the Zen tradition alive for future generations. A pioneering project in an environment that has no Buddhist history, it offers a comprehensive training programme that is based on time-honoured forms of practice yet does not shy away from experimenting with new approaches. The monastery is set up as a community where men and women, monastics and lay-people can practise together under one roof. The programme is based on four elements of training (zazen, ritual, study and the development of social skills) and consists of a daily schedule as well as a calendar of retreats and related events. Everybody is welcome to participate in the programme. The continuity of training is ensured by a team of full-time monastics and novices (at present numbering thirteen), and many people join for longer or shorter periods of time to support and deepen their practice at home. Newcomers always receive special attention. The overnight accommodation has a capacity of forty-two participants in total. All meals are vegetarian. Classes are held in English. Zen River’s founders and head teachers are abbot Tenkei Coppens Roshi and Zen River Cookbook author Myoho Gabrysch Roshi who are both certified by the American based White Plum Asanga and the Japanese Soto School. They are assisted by several of Tenkei Roshi’s dharma successors. Moreover, teachers of other Buddhist organizations are often invited to give lectures and workshops. 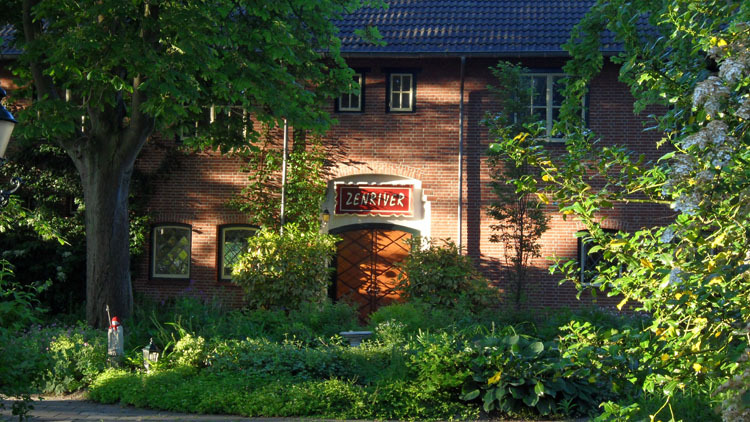 Zen River is officially registered in Japan as a Tokubetsu Jiin (international missionary temple) and plays an active role in the development of the European department of the Soto School. That means that there is a lively exchange between students of Zen River and other temples abroad. Over the years, Zen River has branched out to Keiryuji (a mountain hermitage in the Spanish Pyrenees), to the Zen Boat in Groningen, and to meditation groups in Madrid, Lima, Zutphen, and Hengelo, all under the guidance of certified dharma successors.